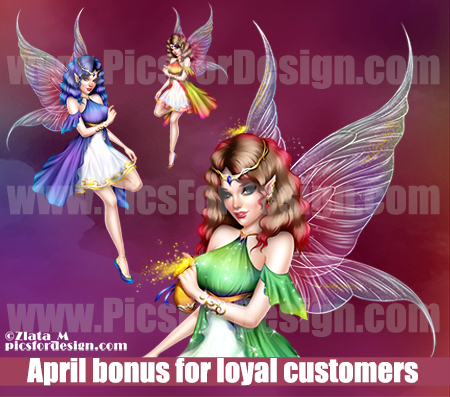 To qualify for the bonus, you must purchase at least 3 images from the catalogue (you can purchase for yourself or as a gift to your friend) in the period from April 1st, 2017, 00.01 GMT + 1 to April 30th, 2017; 23.59 GMT + 1. Submitted by TracyM51 on Fri, 10/13/2017 - 07:42. Submitted by liesje on Wed, 05/03/2017 - 05:40. Submitted by liesje on Wed, 05/03/2017 - 05:37. Submitted by MS_Magda on Tue, 05/02/2017 - 21:20. It's gorgeous!! Thank you sooooooo much!! Submitted by Tweety01 on Tue, 05/02/2017 - 13:50. Submitted by Caroline on Tue, 05/02/2017 - 11:09. She is beautiful! thank you so much. Submitted by Soltona on Tue, 05/02/2017 - 07:51. Submitted by Elfina on Tue, 05/02/2017 - 00:51. Submitted by fb_1428020721 on Mon, 05/01/2017 - 19:26.
die ich als geschenk erhalten habe. Thank you , beautiful gift ! Submitted by Mariesam11 on Mon, 05/01/2017 - 19:13.